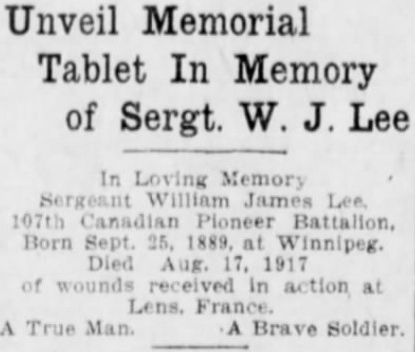 To commemorate the 100th anniversary of the start of the First World War, I am working on a series of blog posts and radio shows that will look at some of the Manitobans who died in action. For more about this project and links to other posts, follow this link. 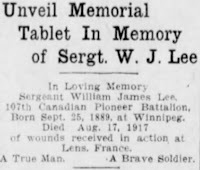 Born and raised in Winnipeg, William James Lee was the son of well-known contractor W. F. Lee and followed his father’s career path. He was married to Lottie Ross, daughter of local detective and restaurateur Albert C. Ross. The Lees lived at 211 Lipton Street, though Lottie may have had family in the U.S. as her wartime contact information an address in Chicago. In her father's obituary of January 1918, she is listed as living at Pasadena, California. 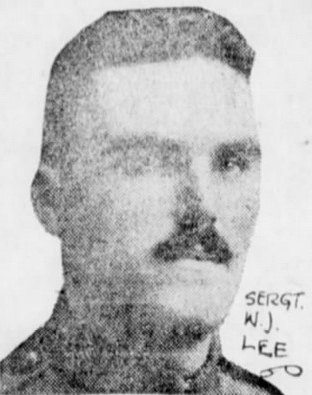 Both Lee and his father-in-law went overseas with Lieutenant Colonel Glen Campbell’s 107th Battalion in 1916. On August 20, 1917, Lottie received a telegram stating that Lee had been “dangerously hurt”, but no further details. A few days later another telegram informed his family that he had died at No. 7 Casualty Clearing Station. His Circumstances of Death certificate notes that he was killed in action on August 17, 1917 from "Shrapnel wounds to head, arm and chest." He was 27 years old.